Though window film is a great DIY product, it’s not always an option to do the work yourself. Altitude, a London based company, came to us with a problem. They have a large South and West facing office, with large windows and a total of 180 panes! Great if you want to grow a crop, but far from perfect for an office. After a site visit, the problem was clear to see. Our installation coordinator recommended a very efficient reflective mirror window film which once applied to the glass would reduce the excess glare, heat, and make the office a much better environment in which to work. The work was completed over 3 days with very little disruption to the staff, and the effects were immediate. A very happy customer! 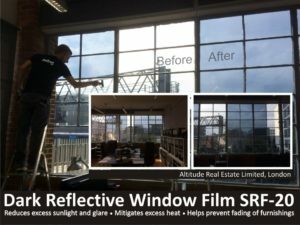 Purlfrost window film installer applying reflective window film in London office. For more information about our window film installation service, or to get a quote, please contact us: installation-service@purlfrost.com. Purlfrost covers London and Greater London, and the Home Counties. How to remove the clear liner on solar and safety window film?